I may have gone a little crazy with my new Gansai watercolours and this tiny butterfly die (MFT). I was playing around with this week's Muse inspiration and ended up making 4 cards. These three are 'rejects' - I'm happy with them, but I'm not going to use them as my Muse entry - that will be here tomorrow. I watercoloured two blocks of colour - the first one (for the first card) was quite muted. I cut a square and then the butterfly from it, for a negative image. 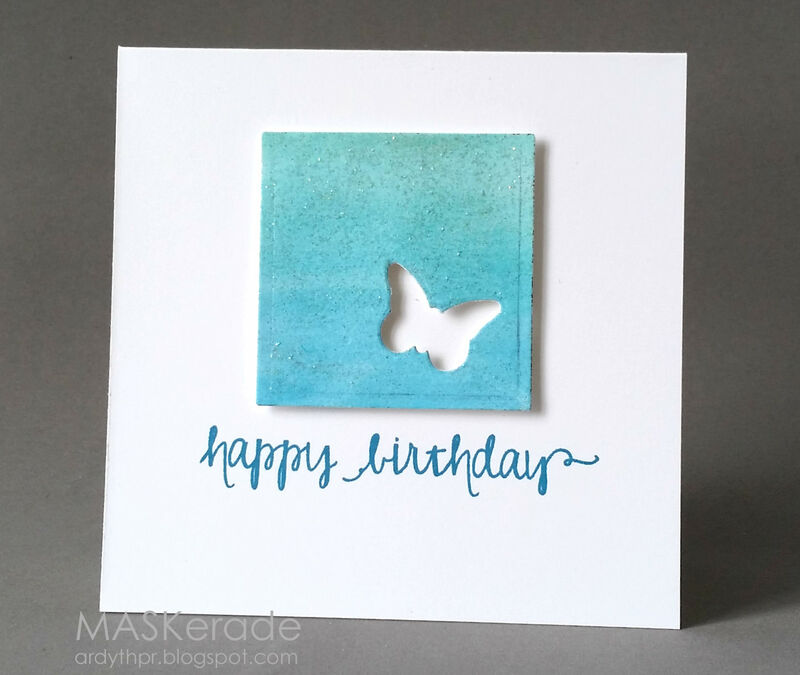 I coated the square in Stardust Stickles and finished the card with an Avery Elle sentiment stamped in Pacific Point. I made the second and third cards using one piece of blended watercolouring that had more contrast and went from yellow through green to blue. For the second card (inspired by this card by Tracey), I used the positive butterflies, edged with my gold Zig Painty pen, and one of my favourite old Inkadinkado sentiments, embossed in gold. Finally, for my third card I used some of the negatives left over to create a panel of 3 butterflies. I finished with a simple (unknown) thank you in charcoal for a more casual feeling. ETA: Despite the fact that there are no Uniko products used here, Sandie and Beverly have encouraged me to link up at Uniko's Things with Wings challenge, so I have. Thank you, ladies! Love your trio of cards Ardyth! The gold edges on the second one are fabulous. Fantastic!!! Cannot wait to see the next one! Love these, Ardyth. If these are "rejects", I can't wait to see what made the cut. All three are gorgeous. So much ombre, butterfly gorgeousness! 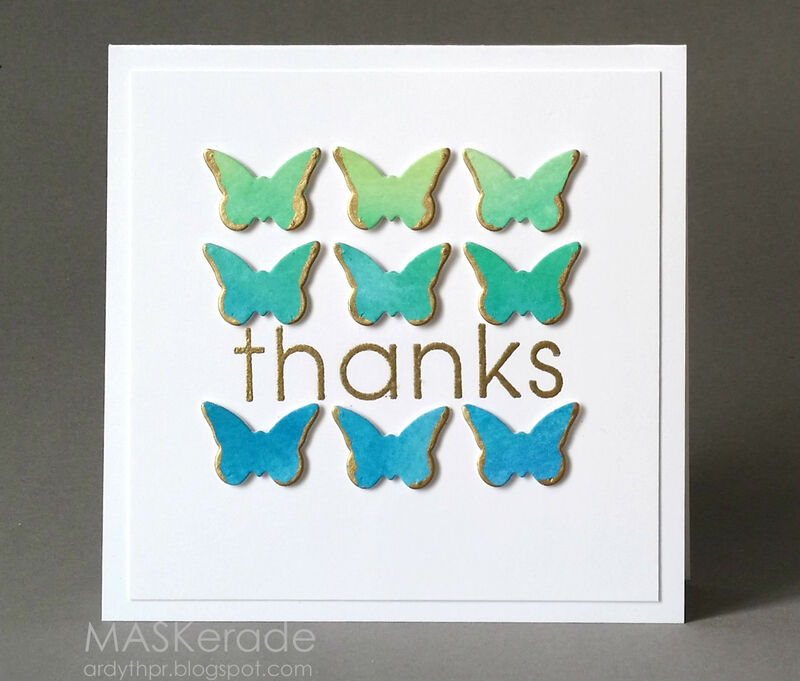 Love the touches of gold on the edges of the butterflies on the second card. Can't believe that these are rejects, Ardyth, they are so beautiful. The blue panel is super and the butterflies with a hint of gold are gorgeous. It'll be so interesting to see your choice for the Muse. These are absolutely gorgeous. I really like all of them the soft blues are so very pretty! "Rejects"....you're kidding...right? I'd be jumping for joy and clicking my heels if I could create ummm...rejects like this! All three are awesome, but the middle one is my fav - love the simple, bold pop of gold between the winged pretties!